United arrived in Kuala Lumpur this morning to news of the explosions in the Indonesian capital, one of which took place at the Ritz-Carlton, the hotel the Red Devils were to be staying at for four nights from tomorrow. After seeking advice from various parties, including the Foreign Office, United confirmed they would not be flying to Jakarta tomorrow. 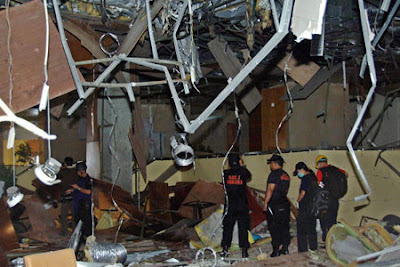 "Following the explosions in Jakarta - one of which was at the hotel the team were due to stay in - and based on advice received, the directors have informed the Indonesian FA that the club cannot fulfil the fixture in Jakarta on the 2009 Asia tour," said a club statement. United were to play an Indonesia Super League XI on July 20. The match had been a 100,000 sell-out. The club must now decide how to reorganise the tour. "We are working on a revised itinerary outside Indonesia with the promoters and we will make a further announcement when these decisions have been made," continued the statement. "We are deeply disappointed at not being able to visit Indonesia and thank the Indonesian FA and our fans for their support. "Our thoughts go to all those affected by the blasts." A decision will have to be made quickly, although it is unlikely Monday's match will be re-organised at this late stage.